Figure 1. Button-controlled LED circuit. This project demonstrates how to use a button to turn a light emitting diode (LED) on or off. You are probably already familiar with traditional light switches that directly control whether or not electrical energy is delivered to a light bulb. In this project, a button is used to control an LED, but the button is not directly connected to the LED. Instead, the button is used to establish a voltage that is “read” via a chipKIT™ digital input/output (I/O) pin. From this voltage, we can determine if the button is pushed or not (i.e., we can determine the button's “state”). The LED is then illuminated in accordance with the state of the button: the LED is only illuminated while the button is pushed. Understand the material presented in the Blinking an External LED project, i.e., using the state of chipKIT pins to control an external circuit. 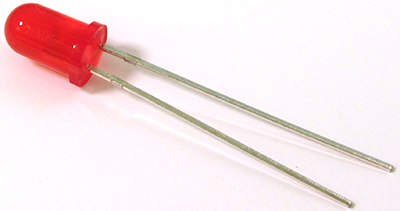 Understand the use of pull-up and pull-down resistors. Understand relational operators and comparison statements. Understand how a chipKIT board “reads” an external (digital) voltage. Using a jumper wire, connect the anode of LED A to pin 12. Connect the chipKIT ground pin (labeled “GND”) to a rail at	the bottom of the breadboard. Rails are often referred to as bus strips. There are multiple GND pins and they are all equivalent. In Fig. 2, the jumper wire is connected to the GND pin closest to the 5V pin. If you are unfamiliar with the use of breadboards, please read the breadboard basics that are covered in the page available via the box to the right. The breadboard rails/bus strips are the two bottom-most and two top-most horizontal rows. All the holes along a row are electrically connected. The bus strips are usually separated from the main section of the board and are sometimes marked in red and blue. Bus strips provide a convenient way to connect a particular voltage (or ground) to various points within the main section of the breadboard and/or to the chipKIT board. For the remainder of this project, the bus strip connected to the GND pin will be referred to as the ground bus strip. Now, attach one end of a 220 Ω resistor to the cathode of LED A. (Resistors behave the same way regardless of their orientation.) The other end of the resistor should be placed so that it connects to the ground bus strip. This can be done by placing the end of the resistor directly into the bus strip. Alternatively, as shown in Fig. 2, you can insert the other end of the resistor into a different column (or node) in the breadboard and then use a wire to connect from that column to the ground bus strip. Before connecting the button to the circuit, it is appropriate to consider a bit of circuit theory so that we understand how a button can be used to produce a signal that can be read by a chipKIT (digital) I/O pin. To obtain a signal where the signal voltage properly corresponds to the button's state, we cannot simply attach the button directly to the chipKIT board—there's a little more to it than that. We need to also use a pull-up or a pull-down resistor. If you are unfamiliar with using a pull-up or pull-down resistor with a button, please read the information available via the boxes to the right. With that background out of the way, we are now ready to build the button portion of the circuit. Connect the chipKIT 3.3V pin to the bus strip (rail) above the ground bus strip that was set up in Step 1. For the sake of simplicity, the LED is not shown in Fig. 3. Place the button into the breadboard as shown in Fig. 3. Since we'll add more buttons in a subsequent project, we will label this button A. Note the orientation of the button: one pair of legs is inserted to one side of the “valley” and the other pair is inserted on the other side. Most breadboards have a gap or valley that separates columns in the main section of the board (with the board placed as shown in Fig. 3). Even if your breadboard does not have the aforementioned valley, the circuit will still be functional provided that you retain this button orientation. Using jumper wire, connect the right side of the button to the 3.3V bus strip. Using a separate wire, connect chipKIT digital I/O pin 7 to the left side of button A.
Connect the other end of the resistor to the ground bus strip (you can use a wire to connect the resistor to the bus strip, as shown in Fig. 3, or you can directly connect the end of the resistor to the bus strip). When the button is pushed, it supplies 3.3V to the attached digital I/O pin. The chipKIT Max32 and Uno32 boards are designed to recognize a range of voltages—from a minimum of 2.4V to a maximum of 5.5V —as a HIGH input for the digital I/O pins. That is, when the software function digitalRead() is called, it returns HIGH if the voltage on the pin being read is within this range. The digitalRead() function will be discussed later in this project. You may wonder why we used a relatively small resistance of 220 Ω for the current-limiting resistor that is in series with the LED, but a relatively large resistance of 10 kΩ for the pull-down resistor. (Note that k is an abbreviation for kilo, meaning thousands, so that 10 kΩ is another way of writing 10,000 Ω.) The size of the current-limiting resistor was discussed in the Blinking an External LED project. This resistor needs to be large enough to ensure that a damaging amount of current does not flow through the LED, but small enough that a sufficient amount of voltage appears across the LED so that it illuminates. On the other hand, a pull-down resistor primarily needs to provide a path to ground while ensuring the respective circuit does not draw an excessive amount of current. We could, in fact, use a larger resistance for these pull-down resistors. However, for reasons we won't explore here, if the resistance is too large, that may cause problems with the sensing of the voltage. At this point, you should now have the button and LED in the breadboard as shown in Fig. 4 and the schematic representation is shown in Fig. 5. The next step is to write the sketch that controls the circuit. Because this sketch uses if statements and comparison operators, we'll introduce those programming constructs after first discussing the digitalRead() function. Figure 4. Complete circuit showing the button and LED. Figure 5. Schematic representation of circuit. A PDF version of this schematic is available here. pinMode(7, INPUT); // Specify that pin 7 will be used for input. int val;              // Declare the integer variable val. val = digitalRead(7); // Assign the state of pin 7 to val. int val = digitalRead(7); // Assign the state of pin 7 to integer variable val. if Statements & Comparison Ops. To make a decision based on the value read from an input signal we need to use a control structure in our sketch that allows the program to do different things based on the outcome of a test. The control structure we will use here is an if statement. Additionally, in the sketch we will write, embedded within the if statement is a comparison expression (or comparison operation). This comparison serves as the test on which a decision is made. If you are not already familiar with if statements and comparison operations, please read the information available via the box on the right. Provided you understand the code shown above, we merely need to add a bit of initialization to obtain the desired sketch. To this end, the following is the complete sketch for this project. Keep in mind that comments (shown in green) are purely for the sake of information and do not affect the behavior of the sketch. Thus, you do not need to enter the comments shown here, but commenting your code is a good practice! * The LED illuminate when the button is pushed. // LED pin used for output. // Button pin used for input. // Set the LED pins to OUTPUT. // Set the button pins to INPUT. * on (i.e., set to HIGH) the digital output pin for the LED. * detected voltage is not HIGH, the function returns LOW. // Read input from button A and compare to HIGH. Once this sketch is uploaded to the chipKIT board, the circuit will be fully functional. Assuming everything is working properly, you press button A to turn on LED A. Changing only the comparison operation in the if statement, make it so that the LED is on when the button is not pushed and off when the button is pushed. Starting with the sketch as given above, again make it so that the LED is on when the button is not pushed and off when the button is pushed. However, this time do not modify the comparison expression. Instead, modify the statements in the bodies associated with the if and else clauses. Add another LED circuit to the breadboard. Attach the anode of the LED to pin 11 and its associate current-limiting resistor to ground. Modify the sketch so that both LEDs turn on when the button is pushed and both turn off when the button is not pushed. With the additional LED attached to pin 11 as described in the previous item, modify the sketch so that the LED attached to pin 12 is on only when the button is not pushed while the LED attached to pin 11 is on only when the button is pushed.